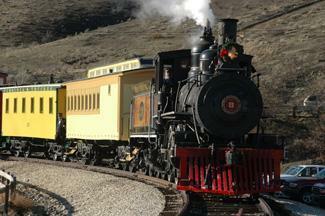 The Nevada State Railroad Museum in Carson City will run the historic steam train in honor of Thanksgiving. Avoid the crowds and chaos of post-Thanksgiving shopping and take an old-fashioned ride aboard historic Virginia & Truckee Railroad equipment on Friday, Nov. 27 and Saturday, Nov. 28. The train departs from the Wabuska Depot every 40 minutes from 10:00 a.m. to 4:00 p.m. Tickets can be purchased at the depot and are cash or check only, just like back in 1905. Fares are $5.00 for adults, $4.00 for seniors 65 and up, $3.00 for kids 6 to 11, and children 5 and under ride free. Trains run every 40 minutes from 10:00 a.m. – 4:00 p.m.
10:00 a.m. ? 4:00 p.m.
For those tired of turkey leftovers, the Elks BPO Carson City Lodge will be selling fresh-made hamburgers, hot dogs and beverages all day long. While at the museum, visit the Museum Store and fill the Christmas wish list. A large selection of books, railroad related gifts, toys and games for kids, adults and train aficionados are available. In addition, the Museum Store will have holiday specials this Friday through Monday, and is open every week Friday through Monday from 8:30 a.m. to 4:30 p.m. The Nevada State Railroad Museum operates steam-ups with historic Virginia & Truckee Railroad equipment on select weekends throughout the year. The museum also participates in scholarly efforts, such as the annual Nevada Railroad History Symposium held in Carson City each fall. The museum is located on Route 395 at the south end of Carson City at the intersection of Fairview Avenue. A yellow train station and red water tank at the entrance to the museum grounds are landmarks. For more information, please call 775-687-6953.